The environment, particularly water, is again dominating local news. A couple of recent storm events indicate to me very clearly that climate change is occurring and it is likely that these events will become more and more frequent. The first storm a few weeks ago caused significant flooding on Atkinson Road, Brandon Road, Glendale Road and on Great North Road in Kelston where an apartment house flooded for the second time in five years. 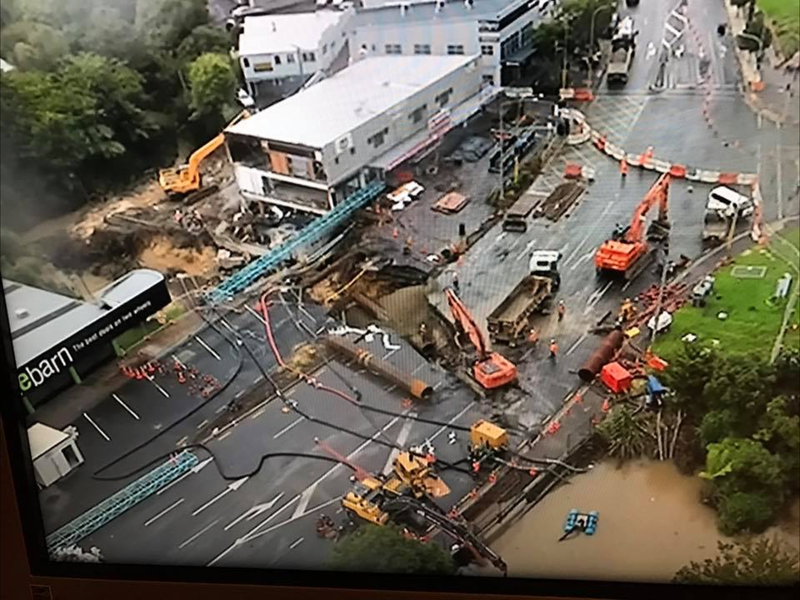 The flooding also caused the under mining of a couple of buildings on Great North Road in New Lynn. The damage caused to the road has thrown the local road system into chaos. I have never seen congestion in the area this bad. Meanwhile the train system is working superbly. It recently passed another milestone when the 19th million passenger in a calendar year boarded. The annual rate of growth is 19.4% and recently an extra million passengers has been added in every four months. The problem is that at current rates of growth the system’s capacity at is going to be fully utilized in the next few years. We may regret not having started the City Rail Link years before. To exemplify the performance of rail I recently caught a weekday 5:30 pm train from Britomart. At about 6:10 pm I reached Glen Eden. The trip was not only a great deal quicker, it was more relaxing and I had much appreciated time to catch up on emails. Now is a very good time to put more train services on the western line if they are available. And I am sure that once people have tried the train system they will not look back. The second storm wobbled at the end and bypassed Auckland. But the destruction it caused to other parts of the North Island suggest that we have no reason to be complacent. The worrying aspect is that our infrastructure is predicated on really large storms occurring rarely. With an increasing frequency of large storm events caused in rising temperatures and water sodden atmosphere we may find that existing infrastructure is inadequate. This issue continues to be high on the Local Board’s radar. Residents and supporters in Oratia are maintaining a well organized and in my view highly effective campaign to persuade Watercare not to site the proposed replacement water treatment plant on Parker Road. They recently held a further well attended, well organized and passionate meeting and invited mayor Phil Goff, local councillors and the local board along. The Mayor requested that Raveen Jaduram, Watercare’s chief executive, also attend which he did. He was treated very politely and his presence assisted greatly in my view in having a proper dialogue about the issues surrounding the proposal. Previously Watercare had declined to take part in these meetings. Raveen’s presence and the dialogue that occurred suggest strongly to me that this decision was the wrong one. One aspect that Raveen was able to clarify was that Watercare would not seek to have any Resource Consent application handled by a Board of Inquiry. The meeting exemplified to me that ongoing dialogue is vital. And while the process is a conventional one in terms of Resource Consent Applications there is a deep disquiet that a Council Controlled Organisation should not be more accountable to the views of citizens. I am convinced that locals would prefer a more organic discussion where instead of being presented essentially with two options (Oratia or Woodlands Park) there was a discussion about options, whether smaller treatment plants could achieve the necessary goal and what sorts of smart engineering choices could be made to minimise disruption. Residents of Woodlands Park have also started to express concerns at the possibility of a plant on the Manuka Road site. Their concerns and values are similar to those of the Oratia residents, they both cherish and are very protective of the environment they live in and they do not want to see their local environment destroyed. Following is an indicative plan that I have received from Watercare that sets out the potential layout of a future site. If constructed in this area it would wipe out part of the Clarks Bush Track as well as the ecological corridor that extends from Laingholm into TItirangi. If this is Watercare’s preferred site I will be advocating for a reduction in the footprint so that the high quality vegetation and the track are preserved. I do not understand why more of the existing plant area cannot be used as already it is proposed that the holding pool be retained. The experience has shown clearly to me the need for reform of the council controlled organizations. There is a virtue in removing day to day management decisions from political influence and financial discipline is important but we currently have the situation where with little notice local communities face potential devastation because of the adoption of a large engineering solution to the city’s need for water. There have to be smarter and more environmentally sensitive ways of dealing with the city’s growth needs and the need to replace ageing infrastructure. The trouble with the Council Controlled Organisation corporate model is that big engineering cheapest price options tend to dominate. In the Waitakere Ranges Heritage Area local people deserve and expect better. The trifecta of news involving water is that of water quality, particularly of the West Coast lagoons. Ecomatters Trust has completed an analysis of local septic systems. The result was that 45% of the sampled properties had systems that were either not up to scratch or failing. If this figure was extrapolated across the West Coast it means that 450 systems need improvement or replacement. The local board had a fund of $50,000 available to locals to assist with the replacement of existing systems. Presuming the fund is applied efficiently it means that it would take 45 years to fix up existing systems. The board intends to continue to have the resources available to address the problem but we will be assessing if this is the most efficient spend of the money. And the inner Harbour beaches are also in poor shape. Titirangi Beach and Wood Bay have had preliminary assessments completed which suggest that the sources of pollution are avarian, dog and human foecal matter. Investigations to the other beaches are ongoing. I will be urging Watercare to review its infrastructure to see if it is contributing to the problem. I believe that we should set a goal for the water quality standards of our lagoons and inner Harbour beaches. They should be swimmable. And this should not mean that on occasions there is a one in 20 chance of contracting an illness from doing so. Finally a couple of photos from recent events to celebrate the strength of community out west. The first is from the recent Holi Festival put on by the Waitakere Indian Association. I have never seen such a happy completely sober group of people in my life! And finally from the Board’s Kauri Karnival also held recently and which was very successful. The process has started in November 2016 and went until April 2017, with a series of webinars focusing on strengthening multi-stakeholder dialogue, building political will and commitment among decision-makers and preparing ministers for their engagement in dialogues.